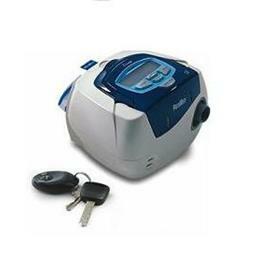 ResMed’s S8 Escape CPAP delivers ResMed superior quality and reliability in a lightweight, compact flow generator. The S8 Escape is the first standard CPAP system with a personal assistant, which guides you through downloads and notifies you when it’s time to call your provider, replace your mask, or change your air filter. Additionally, the new data card option enables you to easily deliver your usage information to your clinician and receive pressure changes without a visit, making communication more convenient than ever. features & benefits small, lightweight system personal assistant with customizable reminders ResScan data card for downloads and settings changes without office visits pressure ramp (0-45 min) 12/24V DC power input automatic power adjustment (100V-240V) manual altitude adjustment large LCD screen Optional integrated humidification with the HumidAire 3i™.